The inclusion of plankton and shrimp meal help make this food irresistible to all pond fish and can be easily consumed by smaller fish including babies known as fry. Crude Protein = 34% min. Crude Fat = 5% min. Crude Fiber = 3% max. Moisture = 12% max. Ash = 12% max. Calcium = 0.8% min. Phosphorus = 0.65% min. Vitamin A = 10,000 IU/kg min. Ascorbic Acid (Vitamin C) = 50 mg/kg min. Vitamin D3 = 1,500 IU/kg min. Vitamin E = 300 mg/kg min. Main Ingredients: Fish meal, wheat flour, herring meal, shrimp meal, sunflower oil, dried kelp, salt, lecithin, astaxanthin, mossasses, yeast powder, squid liver, DL-methionine, calcium carbinate, iron proteinate, & assorted vitamins. ECOLOGICAL BALANCE. If you understand this basic fact, your water will always be clear, not green. FISH WASTE + PLANT WASTE = PLANT FOOD = REQUIRING ADEQUATE PLANTS TO UTILIZE THE PLANT FOOD = BALANCE = CLEAR WATER. Over-feeding fish, and/or not enough pond plants = green water 90% of the time. A simple solution that doesn’t come out of a bottle: Understand proper pond balance, and you’ve got it whipped!! The Ammonia-nitrite-nitrate cycle is a fact of nature. 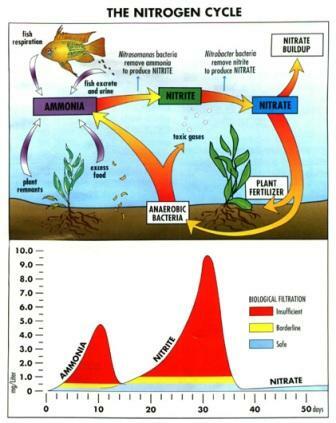 Fish and plant waste (ammonia) get converted by bacterias into nitrite, which gets converted by additional bacterias into nitrate. Ammonia and nitrite in small amounts can be harmful, and even lethal, to fish. Nitrates, the final step, can be concentrated at much higher levels without being harmful to fish. If there are not enough plants to handle this additional nitrate, (plant food), LOOK OUT!! !, nature will supply it free gratis in the form of green water and/or string/filamentous algaes. In a balanced pond, these algaes will still be present, but in low enough numbers that you won’t even notice them without really, really looking. A mature, balanced pond will have literally no traces of ammonia or nitrites, only nitrate. As a result of this information, go slow with a new pond as far as putting in a lot of fish or feeding them a lot for the first month or so. Give it a chance to colonize these bacteria's in sufficient numbers to be able to mature and handle the pond’s biological needs, as well as letting the aquatic and marginal plants get established. Fish, like all creatures, need food to survive. New and improved Aquascape fish foods are scientifically formulated to provide all pond fish with premium quality nutrition at a great price. Quality ingredients, including multivitamins and stabilized vitamin C, provide superior nutrition and will not pollute pond water. 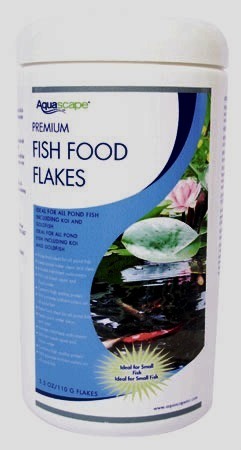 Aquascape fish foods are ideal for all pond fish including koi and goldfish. Aquascape foods contain special ingredients that help produce good bacteria to aid in digestion while helping to eliminate bad bacteria that may cause digestion and other long term health problems. Aquascape foods contain special ingredients that aid in digestion helping to increase growth rates and reduce waste from fish that can negatively affect water quality. Aquascape foods are formulated with multi-vitamins and stabilized vitamin C ingredients that are known to help boost the fish’s immune system and prevent disease. Aquascape foods come in a re-sealable 6 ml protective foil bag that protects the food from air, vitamin degrading light and outside contamination. Aquascape Premium Fish Food uses all natural color enhancers including pure organic spirulina from the Kona coast of Hawaii, helping create beautiful healthy and colorful pond fish. Aquascape Premium Fish Food is high quality protein derived from whole fish including anchovy and mackerel imported from South America. Aquascape Premium Cold Water Fish Food is specifically formulated for colder water temperatures. This proprietary formulation is easy for fish to digest and provides superior nutrition to help fish survive the long winter and provides important nutrients in the spring. Aquascape Premium Color Enhancing Fish Food is specifically formulated to enhance the natural coloration found on koi, goldfish and other pond fish. Aquascape Premium Staple Fish Food is specifically formulated to provide superior nutrition to all pond fish. Aquascape Premium Fish Food Pellets are made from the finest quality raw ingredients. It is relatively easy to formulate a mediocre fish food. Aquascape and our manufacturing partner have shopped the world to find the highest quality ingredients incorporated into a world class quality food. Aquascape Premium Fish Food Pellets is the best valued pond fish food in the market. By partnering with one of the largest aquaculture food producers in the world, Aquascape is able to obtain the best quality ingredients at the lowest possible price, making Aquascape Premium Fish Food Pellets the best valued pond fish food money can buy. Aquascape Premium Color Enhancing Fish Food Pellets use natural ingredients to quickly increase the coloration of pond fish. Increasing red or orange coloration is fairly simple; using premium quality spirulina purchased in Hawaii, along with quality krill meal purchased from the coast of Norway will quickly enhance pond fish coloration. Keeping white coloration from becoming pink or blending with other colors is more difficult. Aquascape fish food balances the amount of traditional color enhancers with a proprietary blend of minerals, the same proprietary blend used to keep fish farmed for sashimi in Japan from having stained or discolored flesh. After extensive laboratory testing we have found that our new formulation will maintain ornamental pond fish with bright crisp white coloration. Aquascape Premium Fish Food Pellets contain a selectively fermented ingredient that allows specific changes, both in the composition and/or activity in the gastrointestinal microflora that confers benefits upon host well-being and health. Pre-biotics are known to help feed good bacteria found in the digestion system while preventing or excluding bad bacteria. Pro-biotics are microorganisms that are used to help promote healthy digestion; the most common types of microbes used as pro-biotics are certain yeasts and bacilli. Two well known pro-biotics, Bacillus subtilus and Bacillus subtilus natto, are commonly consumed as part of fermented foods with specially added active live cultures, such as yogurt. In the past, the only country to utilize this revolutionary enzyme was the Japanese who have been eating natto for almost 1000 years. In recent years, the effects of natto have been re-evaluated. Among the components produced by Bacillus subtilis natto, the following are currently attracting attention. Facilitates the growth of lactic acid bacteria in intestines, thereby effectively preventing diarrhea and intestinal disorders. Contains amylolytic enzyme and proteolytic enzyme to help digestion and absorption, thereby improving feed efficiency. Facilitates the growth of livestock and prevents diseases. Also effective in water purification when used for fishery products. Safe to ferment or produce because the fermentation culture medium is made of soybeans. Free from environmental and pollution problems.